Do you see those dots? Personally, those little suckers annoy me so I am going to rid the world of them. Single-handedly. But with help. 1. 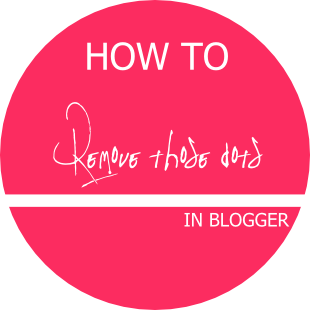 Log into Blogger and select the blog you'd like to rid of the "dots disease". 2. Go to Template >>> Customize >>> Add CSS. This will make the links uppercase. If you'd like to make them lowercase instead, just change that underlined bit to "lowercase". OH MY GOODNESS. THOSE DOTS AND THE FEELINGS OF HATE I HAVE FOR THEM. My blog is a mash of leftover designs by other people and my own stuff, so I don't think I have them. But now I need to check! Great tip! I don't use the simple template but when I did those dots were so annoying!